Originally appeared in the October 25, 2012 edition of the Southside Times. One of my favorite combinations is kale tossed with pasta; and to further accent the health benefits the aforementioned member of the cabbage species, I’ve selected whole wheat spaghetti for this week’s installment. This is an ideal time for this sort of dish—it’s hearty yet healthy, savory and full of flavor. The pistachios add a touch of crunch and a salty hint of bitterness. Because the kale is so sturdy, I recommend tearing out the center rib before slicing. When it comes to slow-steaming the leaves, you want to make sure you soften the kale without overcooking it, as overdoing it will not only damage the color but (like most heat-abused vegetables) deteriorate the nutritional value. That being said, there is some research indicating that some varieties of this species of kale can withstand steaming and other gentle cooking techniques with little to no detriment to tis nutritional composition. Use chicken stock or water to sloe-steam the kale. And of course, if you’d like to make a switch with the butter, you can simply substitute olive oil. Garnish with a sprinkle of parmesan cheese and a scatter of pistachios, and you have a pasta dish ideal for a brisk October evening. 1. Heat a small amount of olive oil in a large sauté pan; add kale and toss in hot oil to coat sliced leaves. Add 2 – 3 ounces of chicken stock, lower heat to a simmer, and cover pan. Repeat this process by stirring and adding stock to gently steam the kale until tender (you may not need all the stock). 2. Meanwhile, bring a large pot of salted water to a boil; cook pasta to al dente. Drain well. 3. Once tender and liquid has completely evaporated from pan, remove kale and reserve. IN same pan, melt butter slow and allow to brown slightly. Add crushed red pepper and garlic. 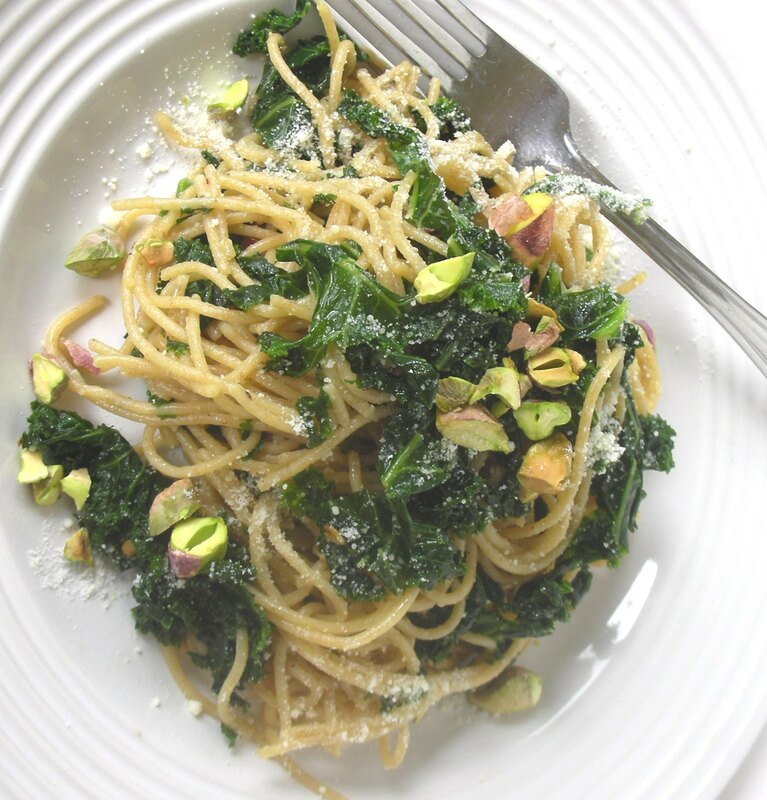 Once garlic is aromatic, pour in pasta and coat in butter; add kale and toss to coat. Stir in parmesan. Adjust seasoning with salt and pepper. At service, garnish plates with chopped pistachios. Originally appeared in the October 18, 2012 edition of the Southside Times. This is one of those recipes that might appear or even sound complicated; but please, dear reader, if this happens to be the case, perish the thought. Just take a look at the ingredient list: 2 simple items along with a bit of seasoning—that’s it. On the other hand, if I had to place emphasis, or at least a culinary caveat, with this dish it’d be in the execution. You want to prep your roll in leisurely yet fastidious fashion, and make sure you tighten this device when rolling it in plastic (you can use your work counter to create traction which helps a great deal). And take your time on searing the exterior. You’ll want to be very aware of the heat of the pan; add a bit of vegetable oil to the hot sauté pan as a bit of insurance, because you want this delicious device to be crispy, not stick to the pan. And when it comes time to slide it in the oven, don’t go overboard—in other words: fish cooks quickly, and it only takes a few minutes exposed to high heat to create a product that’s ready-to-eat. Good luck, have fun, and see you next week. 1. Preheat oven to 375° F. Slice fish lengthwise and place one piece on top of the other, anticipating a more rounded roll later. On a clean work surface, unroll a sheet of plastic wrap. Place four slices of prosciutto in a shingle pattern (staggered slightly to overlap) on plastic wrap, then place fish on top of prosciutto; wrap the prosciutto around the fish. Use the sheet of plastic to wrap and tighten the stuffed breast. Repeat steps for the second breast, and allow them to rest for a couple hours (this will firm them up a bit). 2. In a large, oven-safe sauté pan, heat oil to medium-high. Unwrap plastic from prosciutto-wrapped fish and place in pan, searing the wrapped fish on all sides until prosciutto is crispy before transferring the sauté pan to a 375° F oven for fifteen minutes (or until fish feels firm when pressed). 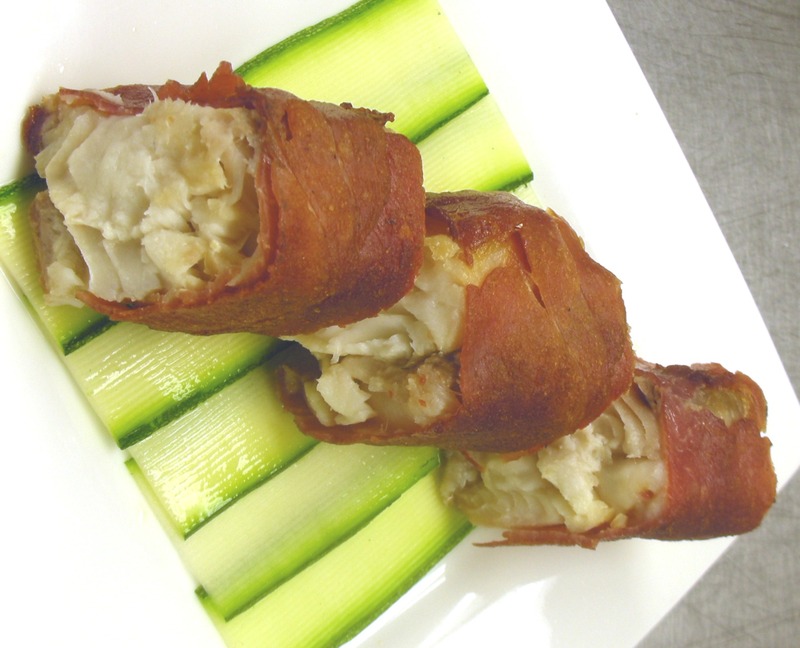 After removing from oven, allow fish roll to rest for about ten minutes before slicing and serving. Originally appeared in the October 11, 2012 edition of the Southside Times. Well, Indy is inching its way toward the chilly chapters of the season—time to think about your culinary reserves. Of course, when it comes to our pantries and fridges, there are items that keep better than others. What I like to do is maintain a few ingredients and incorporate them sparingly throughout the autumn and winter; and as it happens, homemade pesto is just such a culinary concoction. Many Italian factions contend that traditional pesto—a mixture of fresh basil, pine nuts, olive oil, garlic, and cheeses (though there are countless variations)—is associated with the combination of mortar and pestle (which makes sense, etymologically speaking). What’s more, there are pockets of food enthusiasts that won’t budge and that aforementioned execution. Honestly, as long as it’s prepared with care, you can produce a noble pesto in a blender or food processor. Though the key ingredients are delicate, pesto freezes quite well. And here’s a tip for the fridge: in an seal-top container, add additional olive oil to the top layer to prohibit too much oxygen from penetrating your pesto. And it doesn’t stop here; so don’t be surprised if you see another pesto permutation emerge in these pages in the months to come. 1. Pour ½ of olive oil in a food processor or blender, and add in following six ingredients. Blend or process until a smooth paste forms; with motor running, slowly pour in remaining olive oil to evenly incorporate. Reserve pesto in a bowl or dish and set aside. 2. Preheat both an oven-safe sauté (or grill pan) along with an oven (set to roughly 400° F). 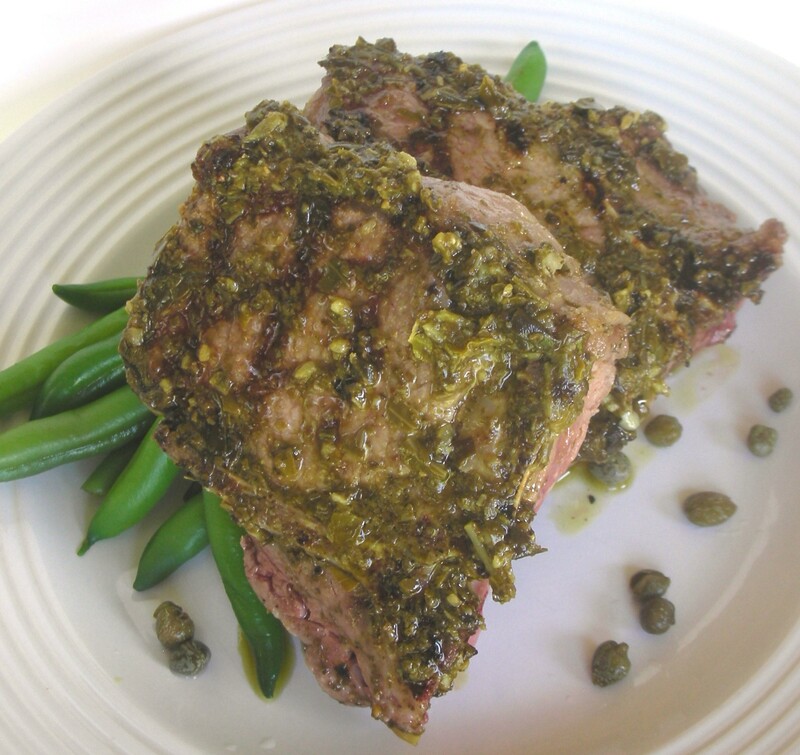 Using a pastry brush, apply a bit of the pesto to the exterior of the chops; add a small amount of olive oil to the pan and add lamb chops. Sear on all sides, brushing on more pesto before placing in oven to finishing cooking to desired doneness. 3. Remove lamb chops from oven and allow to rest for 7 – 8 minutes. Serve the chops with a fresh vegetable, and sprinkle plates with pickled capers. Originally appeared in the October 4, 2012 edition of the Southside Times. Don’t get me wrong, I love shellfish. But a little bit goes a long way. Give me a modest-sized yet high-quality disc of lump crabmeat formed into a crispy, golden cake and it’s aces in my book. Then there’s the alternative: a hearty portion of a mostly-breaded concoction formed into a rubbery puck. No thanks, friend. What I’m trying to tell you is this: you don’t need to break the bank to impart all the hallmarks of high-quality ingredients—particularly lobster. You only need a little lobster here. (In fact, I’d rather have you focus on technique with the cooking of the risotto grains, but we’ll get to that in a second.) 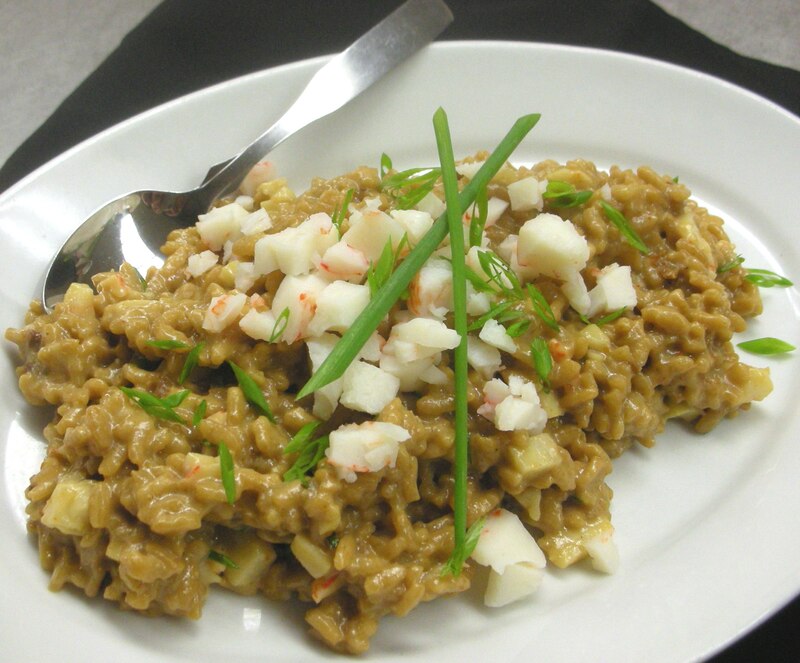 We’re just looking to impart a little flavor and permeate this creamy dish with the distinctive aroma of lobster. The sundried tomato adds a bit of tartness to counterbalance the sweetness from the lobster. Now, back to technique. If, while stirring your risotto, it seems as though your arm might fall off, you’re doing things precisely right. This takes a little labor, but as I’ve said before: it’s worth it. And although it’s perfectly fine to be selfish with shellfish, don’t forget to share. 1. Heat the oil and half the butter in a large saucepan over medium heat. Add shallots and cook for several minutes until tender; add sundried tomatoes and cook until tender. Add the rice and cayenne and cook, stirring frequently for about 2 minutes, until rice is translucent and coated with hot fat. 2. Pour in vermouth (it will bubble and steam rapidly). Stir continually until liquid is absorbed. Add in a large ladleful (about 1 cup) of simmering stock, and continue to stir constantly until liquid has absorbed. 3. Continue adding the stock, about half a ladleful at a time, allowing each addition to be absorbed before adding the next installment. Never allow rice to cook completely dry. This should take 20-25 minutes. The risotto should have a creamy consistency and the rice should be tender, but firm to the bite. 4. Stir in tomatoes and cream, and cook for a couple minutes. 5. Add the cooked lobster with the remaining butter; add in chervil or dill. Cook long enough to just gently heat the lobster. Serve immediately.